Entrance to the market. Photo by Borough Market - John Holdship. 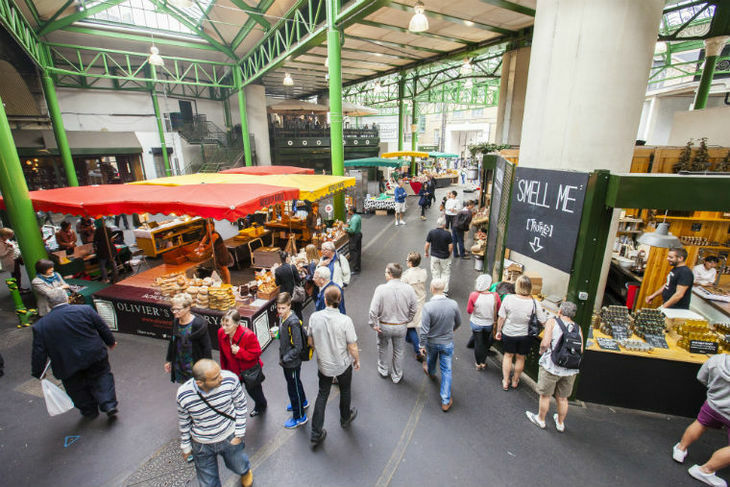 London's oldest food market, the vibrant Borough Market has been around for over a thousand years. Not only is it UK's best-known — it's one of the most famous food markets in the world. It's survived for so many centuries because a 1754 Act of Parliament ruled that it would remain "an estate for the use and benefit" of the local community "forever." In its current form, it's owned by a charitable trust and governed by a board of volunteer trustees. The market is crammed with stalls run by highly knowledgeable small producers who grow, cook, or directly source the food that they sell. 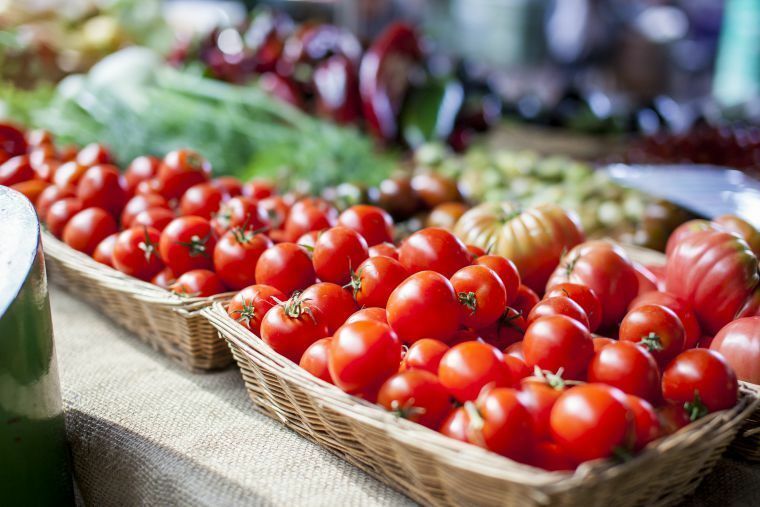 Sharing its philosophy of transparency in food production, provenance and flavour with the Slow Food movement, it has many Slow Food-accredited traders. Indeed the market itself, and a number of its stallholders, are regular recipients of Slow Food awards. Additionally, there's a strong commitment to the environment: as much as possible is recycled, rainwater is collected to feed the plants, and low-energy lighting is used. So, then, how do you get the most out of this sprawling international icon… and, first of all, where do you start? The bustling market. Photo by Borough Market - John Holdship. You'll appreciate the market more if you learn about its colourful past, and can place the venue and its buildings in a historical context. Read up on its fascinating history here. You'll discover how the market has been in existence in some form or other since before 1014; and how its fortunes were revived in the 1990s, when our current interest in artisanal foods began to take shape. Borough Market's Three Crown Square. Photo by Borough Market - John Holdship. The market is a mixture of open spaces and passageways lined with shops and stalls. Three Crown Square is its largest trading area, selling essential produce including fruit and veg, meat, fish and cheese. In the spaces around are speciality foods from around the world. A map will give you an idea of the market's layout. However, the best way to experience it is to simply walk around. Follow the crowds and the food aromas, and you'll eventually find your bearings. If it's your first visit, take a quick walk around, then re-visit the shops that caught your attention the first time around. Take your time, linger as long as you like, talk to the traders, and get to know their products. Don't be afraid to get stuck into samples. Colourful caulis at Ted's Veg. Photo by Borough Market - John Holdship. If you're short on time, or looking for a more organised approach, why not book yourself on a walking tour. Cookery writer Celia Brooks is the only person officially licensed by the market to conduct guided tours. In her three-hour walks, she'll tell you about the market's history, producers and ingredients. There are plenty of tastings along the way, including tutored wine and food sessions. Brooks tells us: "People are fascinated by the depth and complexity of every bite and sip we take, but also love to learn how to use so many amazing products and ingredients in their own kitchens… They come away enlightened to many surprises they didn't know existed." Borough Market isn't only for shopping. It hosts a wide range of lively, topical, thought-provoking and fun events throughout the year. They're led by renowned chefs, food writers and food and drink personalities. Make a point of planning your visits around these. Food festivals, talks and debates may include everything from an evening of free cheese tasting, to a seminar on the future of food. Or join the Cookbook Club that meets at the Cookhouse. There are cookery demonstrations, too, from respected chefs and cookery writers in the market's demonstration kitchen. Jenny Chandler, who specialises in cooking with beans and lentils, demonstrates here regularly. She enthuses: "Demonstrating at Borough Market is a privilege. Every time I set off around the market with my shopping list, it's like winning Wonka's golden ticket; buying some of the best ingredients the world has to offer and, most importantly, learning, always learning something new, from the knowledgeable and passionate traders." If you’re not taking a guided tour or attending an event, avoid peak times. There's a limited market (which means not all stalls are open) on Mondays and Tuesdays, and a full market between Wednesday to Saturday. Get there as early as you can to beat the crowds. The best time to visit is between 10am to midday Wednesday to Friday; and 8am to midday on Saturday. Yes, Saturdays are the liveliest, but also the most crowded. Alternatively, go at around 4pm. The crowds will have thinned out by then, and many stallholders will give you their unsold products (especially perishable fruit and veg, baked goods and cooked dishes) at a heavily discounted price. Gourmet Goat's kid goat meat kofta. Photo by Melissa Thompson. 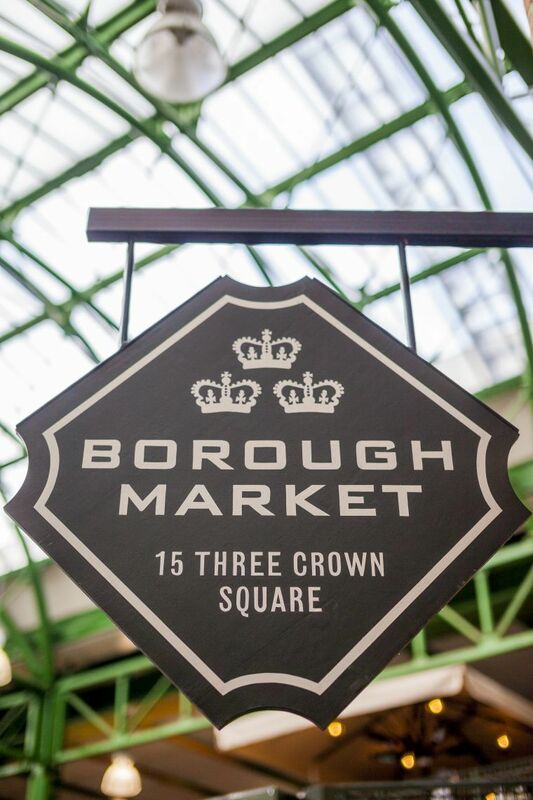 Borough Market publishes a bi-monthly Market Life magazine, available at the market and at London Bridge station. It's packed with top-quality writing from some of the capital's most acclaimed food writers. There are exciting recipes that you'll want to cook immediately, interviews with various food personalities, news about seasonal or speciality ingredients, and profiles of new market traders. This information is also available in a condensed form in its email newsletters, so make sure you sign up to these. They'll keep you updated on the latest goings-on, and you'll learn what’s in season. 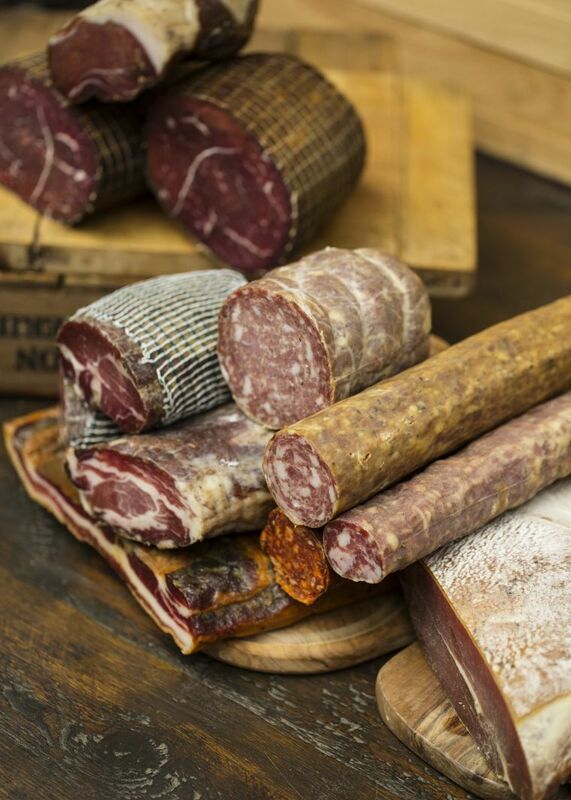 Cannon & Cannon's British charcuterie. Firstly, let us tell you about two of our favourite shops. 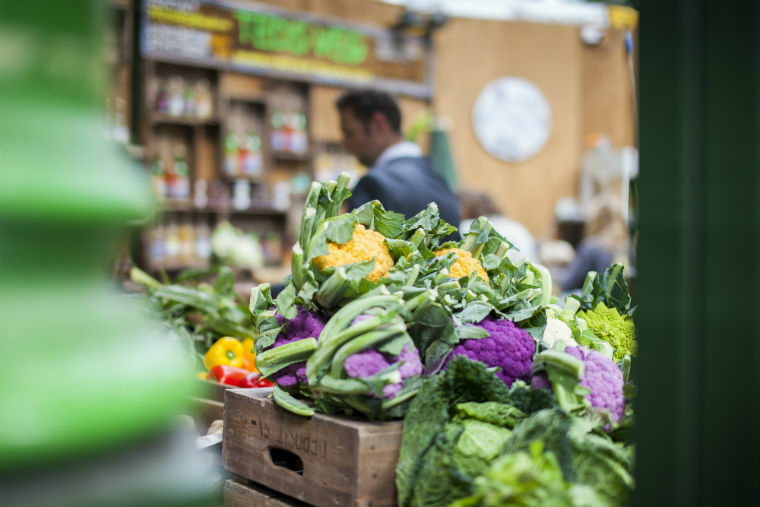 One of the very best greengrocers in the capital, Turnips sells seasonal and speciality fruit and veg from farms around Britain, Europe and beyond. And the small, aromatic Spice Mountain is crammed with amazing spices and herbs from around the world, making it one of the best speciality shops in the UK. There are plenty of baked goods too. Located in Cathedral Street, you can watch bakers at work in the glass-fronted Bread Ahead bakery and cookery school. They also have a stall in Three Crown Square. The Flour Station sells long-fermented sourdoughs, and a good choice of cakes and pastries. Pieminister is popular for its hearty British meat and vegetarian pies. For something even meatier, acclaimed butcher The Ginger Pig sells British meat and offal. The highly regarded British charcuterie brand Cannon & Cannon hosts events, tastings and workshops at their Meat School in Jubilee Place. Cheeses rarely come better than the locally matured British and Irish ones available at the revered Neal's Yard Dairy. Making cheese locally in Bermondsey, Kappacasein is also famous for its cheese toasties (and their Swiss raclette, too, is delicious). A firm favourite of serious coffee lovers, Monmouth Coffee Company sells locally roasted beans and freshly made coffees. Horn Ok Please's delicious bhel puri. Photo by @katymarketfresh. Another company specialising in London-made cheeses, Blackwood is based in Brockley. It specialises in soft raw cow's milk cheese. Rubies In The Rubble is a commendable social enterprise that employs disadvantaged people, and sells homemade jams, chutneys and preserves, cooked using excessive fruit and veg that would otherwise go to waste. Handcrafted spirits and liquors have become fashionable in recent years, and the East London Liquor Company sells ones made in a converted glue factory in Bow Wharf. British recipes, ingredients and flavours are the big draw here. A number of shops focus on just one type of product. Nut Farms sells cobnuts and walnuts grown in Kent; plus excellent cold-pressed nut oils. The Tomato Stall sells organic Isle Of Wight tomatoes that professional chefs make a point of boasting about. Sweet Roots is very niche: it sells liquorice products from Calabria in Italy. Brindisa's Borough Market shop has been recently refurbished. The market is a microcosm of London life: it sells high-quality and hard-to-find ingredients from around the world. 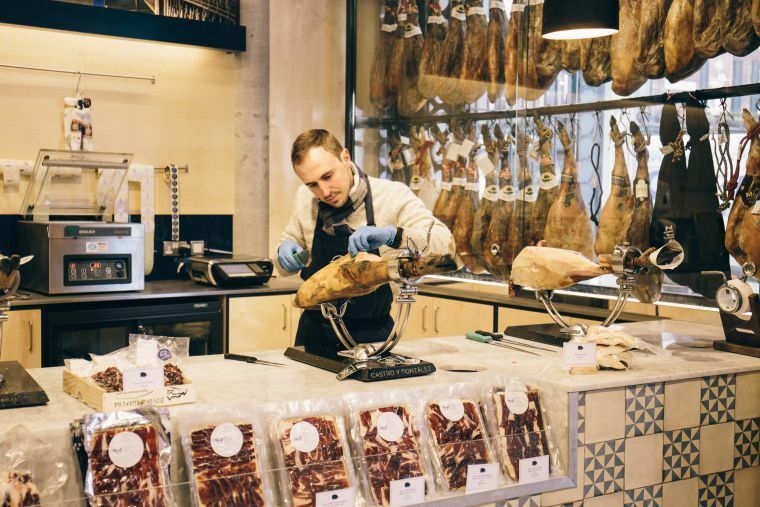 Monika Linton's renowned Spanish deli Brindisa sells top-notch imported Spanish foods. 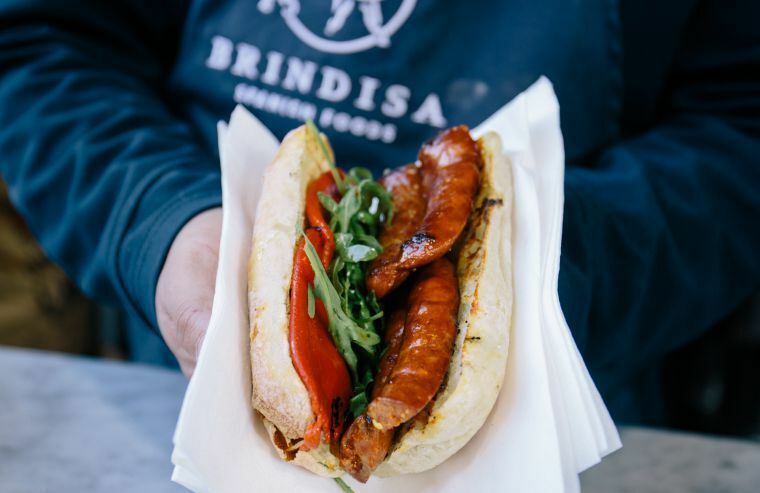 Don't miss their legendary chorizo roll, served outside the shop. The many varieties of Mexican chillies can be difficult to get hold of in London, but Cool Chile Co sells a great range; plus Mexican herbs and spices, freshly made sauces, tortillas and corn products. The long-established Italian deli Gastronomica sells imported products from small producers around Italy. East European bakery Karaway specialises in delicious and wholesome rye breads. Ran Wilson's vegetarian Israeli boureka pastries, made according to his grandmother's recipes, can be found at Balkan Bites. There's also a large choice of delicious street food from around the world. Famous food writer Anissa Helou's Koshari Street specialises in koshari: a wholesome Egyptian vegetarian mix of rice, lentils, pasta, caramelised onions and spices. 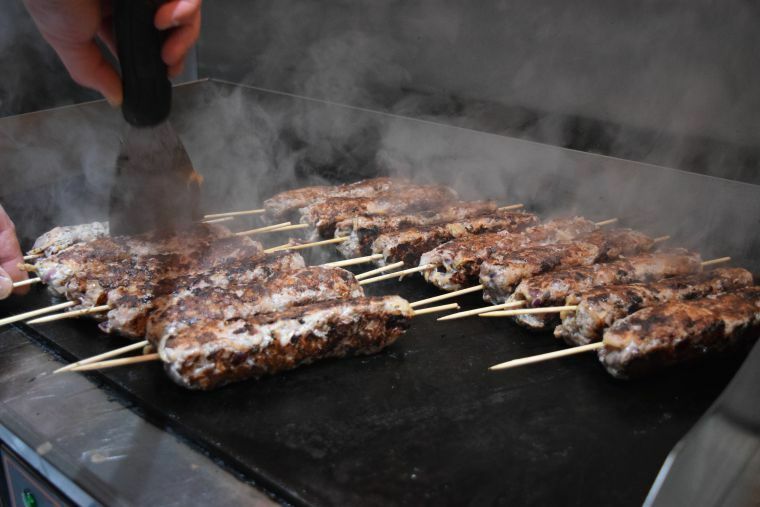 Award-winning Gourmet Goat's USP is east Mediterranean village food centred on the meat of young male goats, as well as ethically produced rose veal. Gujarati Rasoi serves up home-style vegetarian dishes from western India, such as moong dahl, potatoes with fenugreek leaves, and cauliflower with peas. 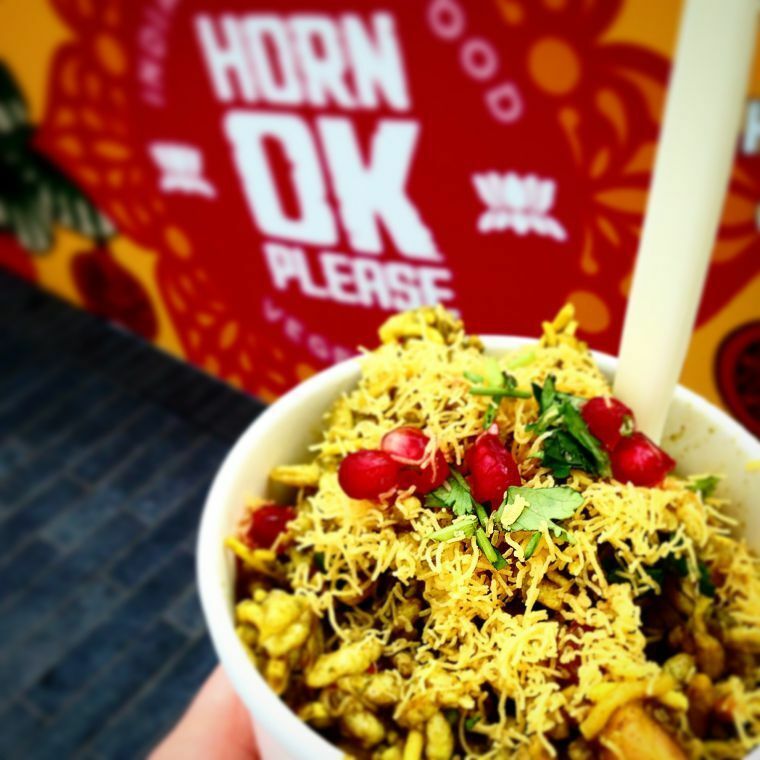 Also specialising in veggie Indian fare, Horn OK Please sells tasty street food, including bhel puri and aloo tikki chaat. The hugely popular Ethiopian Flavours sells spicy meat and vegetarian stews with injera bread. It's well worth waiting in the queue. 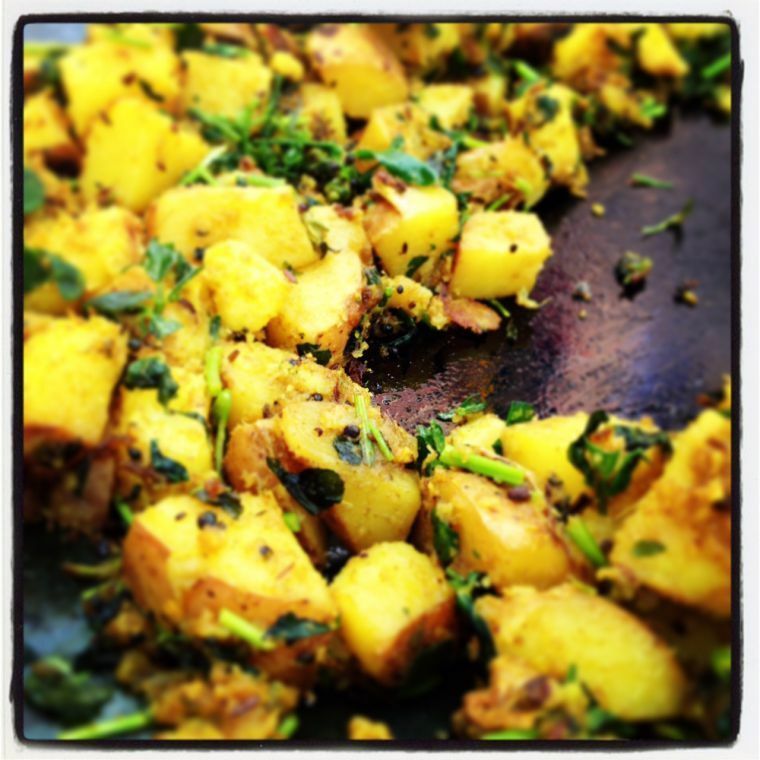 Gujarati Rasoi's very popular potatoes with fenugreek leaves. So you've been nibbling, munching and grazing all day… but you must leave room for a sit-down dinner. There are a number of wonderful restaurants and bars in the area, such as the contemporary Middle Eastern Arabica Bar and Kitchen and chocolate-centric Rabot 1745 in nearby Bedale Street. It's a unique place where every dish is based on some part of the cocoa tree. And you can't miss Iqbal Wahhab's Modern British Roast, located right inside the market. It's also an ideal place to kick off your day with a glass of champagne — a toast to all the good things to come. Expect produce of this quality. Photo by Borough Market - John Holdship. Borough Market, 8 Southwark Street, SE1 1TL. Open Monday-Thursday 10am-5pm; Friday 10am-6pm; Saturday 8am-5pm. Limited market Monday-Tuesday; full market Wednesday-Saturday. 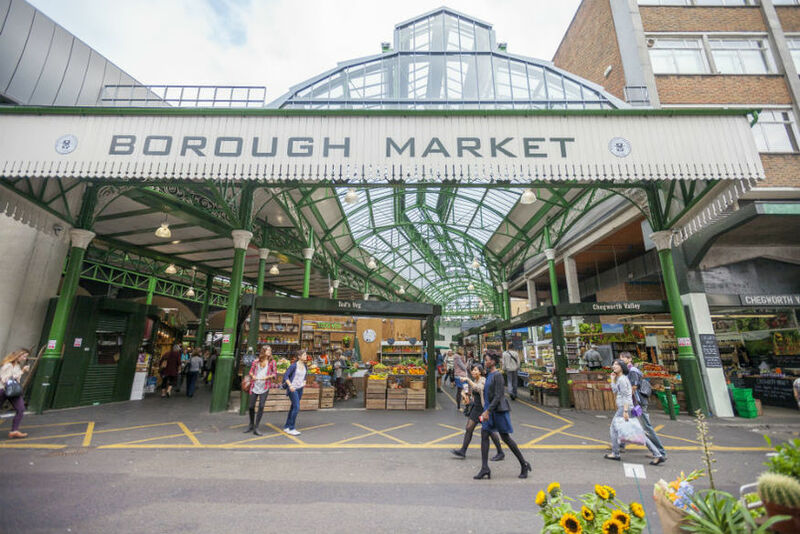 Find out more about Borough Market with our video guide.